The Angriest: Star Trek Enterprise: "Carpenter Street"
In "Carpenter Street", Archer and T'Pol are sent by the elusive Crewman Daniels to early 21st century Detroit, where a small team of reptilian Xindi are creating another super-weapon with which to destroy the human race. This is all feeling suspiciously like deja vu. Last episode we were revisiting one of the worst episodes of Star Trek: Voyager, the episode before that was revisiting classic Star Trek "human history on another planet" shenanigans, and now we're travelling back in time to the present day in a well-worn fashion. This story arc is beginning to feel less like a bold new direction and more like a greatest hits package. No wonder audiences were fleeing the series in droves - we've seen all of this many times before. It is also an odd episode, because unlike other sojourns into the past (Star Trek IV, "The City on the Edge of Forever", et al) this one's clearly been produced on the cheap with a minimal cast and very little in the way of future-present interactions. At the beginning it feels like it's going to be a momentous adventure. By the end, you're wondering why they bothered. 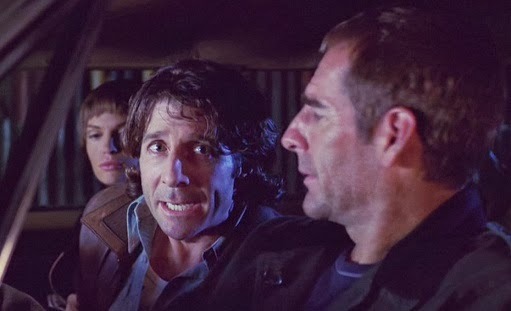 The episode's main guest star is Leland Orser as Loomis, the human hospital technician who's been drugging innocent people and dropping them off for the Xindi to experiment upon. I like Orser a lot - he played a long-running part in the medical drama ER - but I do feel there should have been a better episode or role for the production team to give him. The sudden return of Crewman Daniels feels odd, but then it always does: this temporal cold war is one of the most stop-start, half-hearted arcs in the history of SF television. The writers needed to either commit to it or abandon it. The manner in which it pops up twice a season and then vanishes is getting needlessly frustrating. There are some admittedly nice moments of character between T'Pol and Archer, particularly given the former's long-running skepticism about the possibility of time travel. This is one of those episodes where, while it's not exactly bad, its content fails miserably to match its premise, and I've finished it more annoyed than entertained. That in mind, I can't give it a thumbs-up. This leaves Season 3 with six good episodes out of 11, and a running season score of only 55%.